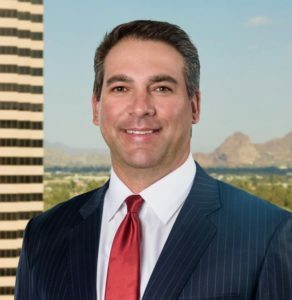 Born and raised in Phoenix, Arizona, Attorney Scott I. Palumbo helped to co-found Palumbo Wolfe & Palumbo with his father and long-time friend Elliot Wolfe. Mr. Palumbo attended the University of Notre Dame, where he obtained his undergraduate degree and was a letterman on the varsity football team. From there, he enrolled in the Arizona State University Sandra Day O’Connor College of Law where he obtained his law degree. Since becoming a practicing lawyer, he has dedicated himself to defending the rights of those who have been victimized by personal injury accidents and those who have lost loved ones to wrongful death. Mr. Palumbo is proud to have received a AV® peer review rating by Martindale-Hubbell® – the highest rating for exceptional legal ability and high ethical standards. 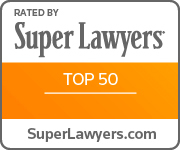 Super Lawyers® has selected Mr. Palumbo for inclusion in its 2013 – 2019 Super Lawyers lists. Super Lawyers® has also recognized Mr. Palumbo as one of the “Top 50 Arizona Super Lawyers” every year since 2014 which makes him the youngest Arizona attorney ever to receive that recognition. He has also been repeatedly honored by AZ Business Magazine as one of the “Top 100 Arizona Lawyers.” Mr. Palumbo has been chosen for inclusion in The Best Lawyers in America in the practice areas of Plaintiffs Medical Malpractice Law and Plaintiffs Personal Injury Litigation. The National Trial Lawyers Association has also named Mr. Palumbo as one of the “Top 100 Trial Attorneys” throughout Arizona since 2009. Beyond that, he maintains a membership in the Multi-Million Dollar Advocates Forum – an organization that maintains membership exclusively for those lawyers who have recovered settlements or verdicts in excess of $2 million dollars. Mr. Palumbo also maintains a “Superb” rating of 10/10 on AVVO.com. Mr. Palumbo currently lives in Phoenix, AZ with his wife Emily and their two wonderful children. If you have further questions or if you would like to discuss your potential case, you should not hesitate to pick up the phone and contact Palumbo Wolfe & Palumbo as soon as possible. We know how daunting it can be to file a claim or pursue a lawsuit and we are dedicated to ensuring our clients get the high-quality assistance they deserve. $7,850,000 recovery for the family of a man killed by a defective vehicle. $7,000,000 jury verdict on behalf of a motorcyclist injured by a driver who pulled from a private drive into the path of the plaintiff’s motorcycle. $6,000,000 resolution in a strict product and premises liability case. $5,750,000 recovery in a nursing malpractice case. $3,400,000 settlement for the family of a man who died as a result of orthopedic medical negligence. $3,400,000 resolution on behalf of a repairman who was severely burned on the job. $2,370,000 recovery for a couple injured as a result of a defectively designed freeway intersection. $2,250,000 recovery for the death of a father killed by a negligent driver. $2,100,000 recovery for injuries sustained by a motorcycle rider hit by an automobile. $2,000,000 resolution for a family whose husband/father was killed in a hospital. $1,700,000 recovery for man hit by a pick-up truck. $1,700,000 settlement for automobile crash caused by drunk driver. $1,500,000 recovery for family whose mother was killed in car collision. $1,475,000 recovery for a couple who each sustained permanent injuries after being run over by a USA government boat. $1,300,000 settlement on behalf of the family of a man killed on a construction site. $1,160,000 recovery for the family of a wife and mother who died as a result of medical negligence. $1,115,000 settlement on behalf of a gentleman injured by a driver who pulled her vehicle into the path of the plaintiff’s truck. $1,055,000 settlement for a couple injured by a tractor trailer on the Interstate. $1,025,000 recovery on behalf of a truck driver injured when a loading dock gate toppled on top of him. $1,000,000 recovery for a victim of medical negligence. $1,000,000 recovery for a victim of hospital negligence. $990,633 jury verdict on behalf of a young woman injured in a car crash. $940,000 recovery on behalf of a woman injured in a Ranger ATV rollover crash. $925,000 resolution on behalf of a gentleman injured in a private airplane crash after the pilot failed to follow proper landing procedures. *These results are not typical and should not create an expectation of future results. View Scott’s legal profile on Avvo, Justia, Lawyer Central and HG.